buildings are designed, built,managed and retrofitted using BIM. facility management, operation and maintenance. building data to allow analysis of interaction between business and facility. EcoDomus software provides a ‘Common Data Environment’ for all relevant types of information. significant reductions in labour hours and energy use. integrating with facility data management systems. data collection, analysis and asset data maintenance over the whole facility lifecycle. • Secure access to the common data environment and good management practice built-in. • Support for open information standards, for example COBie. • Scalability to support Internet of Things (IoT) and Big Data applications. • Mobile and web interfaces to support site-based working. • Deployment in the Cloud or behind private firewalls. it’s impossible to build a solution that would be equally good at all parts of facility’s management. is added during the project and is contained in Project Management systems. Other information is managed in the commissioning or maintenance or space management systems. Add to that spatial data from GIS and live sensors data from BAS and you get a pretty complex picture. 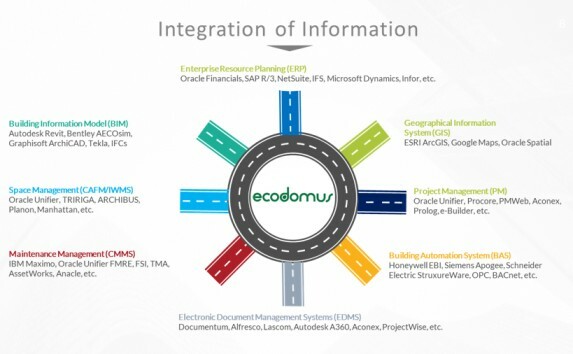 EcoDomus connects to these applications and provides them with the unified Asset Information Model. each one of them automated only specific processes. EcoDomus’ goal is to contain or connect facility data sources to create a complete picture for the facility elements.